Roses indeed are associated with cool climates like San Francisco, Portland and even London. They will, however, flourish in a variety of climates in Hawaii. 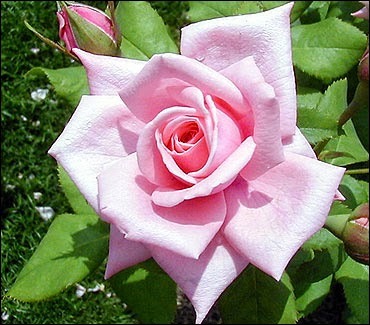 The early missionaries brought the older type of roses, not hybrids, to the Islands. In Hawaii, roses can flower throughout the year in the warmer, sea level climates. They can also be in continuous bloom in the cooler mauka (mountain) communities. Rose bushes grown with less sunlight than six hours will tend to be tall and leggy with fewer blossoms. Roses will benefit from mulch 4-6 inches. This reduces the temperature of the root environment, helps to control weeds, supplies nutrients to the ground and improves the physical characteristics of the soil. A fertilization program should be guided by a soil analysis. For further information on nutrition, and other rose topics, including specific cultivar recommendations, the UH CTAHR (College of Tropical Ag & Human Resources) website has an old, but good publication entitled, Rose Growing in Hawaii. Roses are seldom free of pest. This is especially true in the tropics. Chinese Rose beetles are frequent and serious pests which come out after sunset and chew on the leaves. Tiny spider mites, aphids, thrips and grasshoppers will also attack the plants. Diseases like powdery mildew, black spot and rust are common. The rust appears on the underside of the leave as powdery pustules of bright orange spores. Diseases are particularly difficult to control when rainfall is high. USE the Search this Blog. Type in the name of the plant or the pest. Some guests have problems in the garden and do not know the cause. CLICK on FAQ - frequently asked questions. Click on the link for the answer. It's all in the book! and for a limited time FREE SHIPPING!